Hello all! I'm baaaack with a new video! It's been awhile, I'm so sorry! Been broadsided with a few things last few weeks that were making it so so hard for me to create and turn the camera back on! I really missed it though and am looking forward to the ones to come! Today I have a card I made when my set Stately Flowers 12 set first came, using a couple Distress Oxide ink pads to create this glowing distressed floral background in no time! Greeting and hearts are from the current Incentive set You Get Me. Also a peek of a new product coming this week to Gina K. Designs, the Tidy Towel! Please enjoy! So like I said, coming this Thursday to Gina K. Designs: The Tidy Towel is a lint free towel that measures approximately 6" X 8". The color is called slate and when wet, it turns black. It can be used with just water or you can add a little stamp cleaner when necessary. The Tidy Towel is packaged damp and can be stored damp however, if it is left out and gets completely hard, it will reactivate by soaking it in water for a few minutes. Frisky Felines and Playful Pups Hop! Good morning! 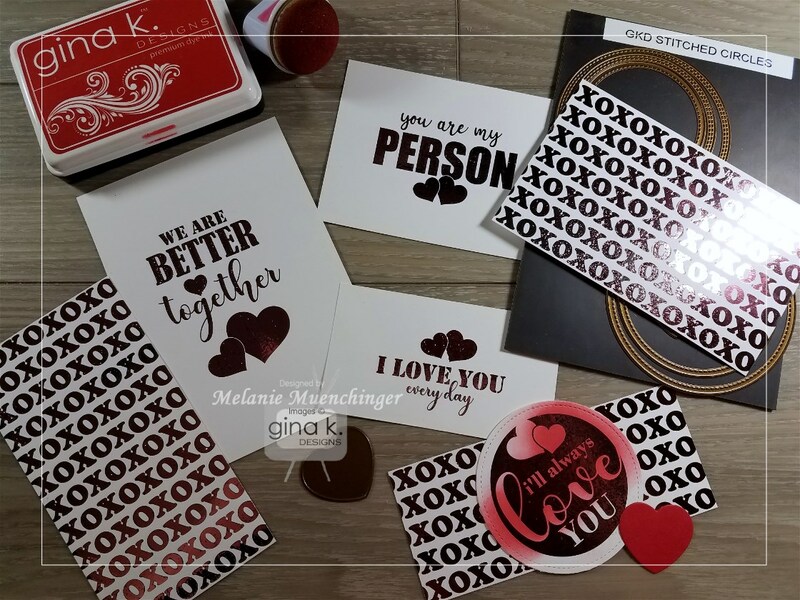 Welcome to our February inspiration hop, featuring awesome sets from Gina K.'s daughter, Alicia Krupsky! Ready to get your cat and pup on? Here we go! As exciting as it is to get to that next blog for more eye candy, be sure to comment on the blogs as you hop because Gina has a $50 gift certificate to give away! Winner will be randomly drawn from all comments and announced on StampTV a few days after the top! Check the Big News Forum. The first card features Frisky Felines. (Love the dies for both these sets to quickly make a dimensional critter!) 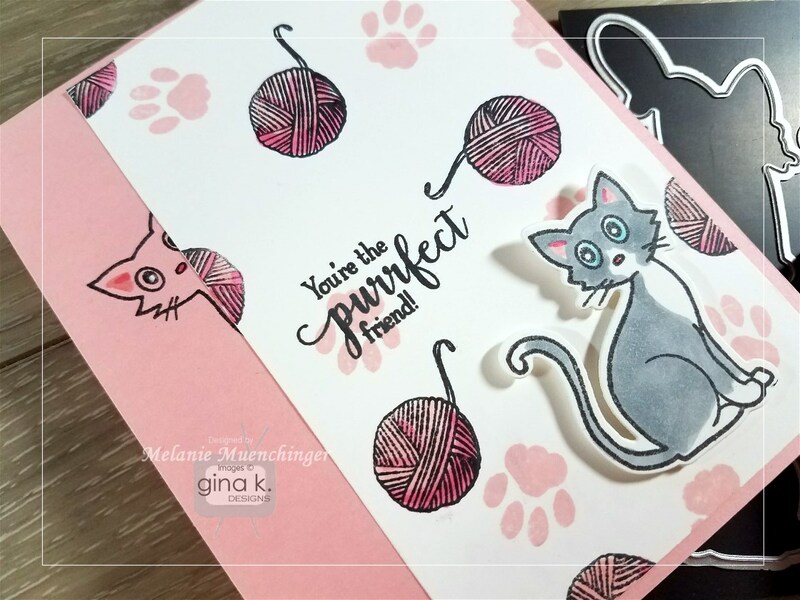 I stamped up a background with the paw and yarn, stamped my sentiment and cat, and added one peeking out, ya know, the way cats DO! Cat lovers recognize these little cat "quirks" and behaviors and will make your cards extra fun! Cardstock is GKD Pure Luxury White and Innocent Pink. The second card features Playful Pups. Playful, indeed! I stamped the Inspiration Mosaic frame to give me a nice layout for these little guys and a perfect spot to pop in the darling greeting. Just add puppy treats! 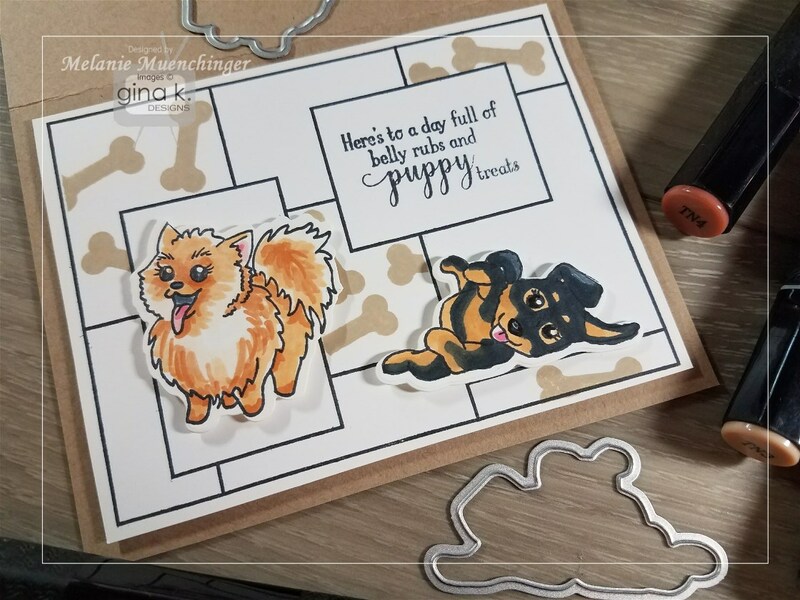 I masked these stamped dog bones in GKD Kraft ink into 4 of the mosaic sections, and then colored and popped up the stamped and die cut puppies. Cardstock is Pure Luxury White and Kraft. 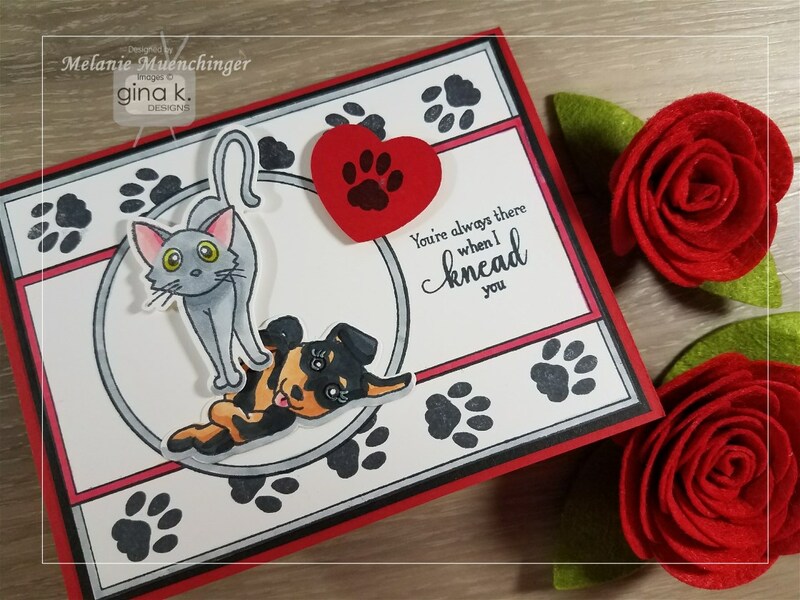 I made a third card for today's hop because I couldn't resist mixing the two sets when I saw how perfectly the belly rub pup and standing pose cat went with the "...when I knead you" greeting for the cat set! I die!! Nothing like those two little paws kneading accompanied by contented purring to make all your troubles melt away! I colored in the borders of my stamped Holiday Frame with Spectrum Noir markers and masked in some paw prints at the bottom and top. Base and die cut heart (from Gina's Double Stitched Circle die set) are Pure Luxury Red Velvet. Ready for more furry inspiration? Let's see what the rest of our talented Gina K. Designs team has today! 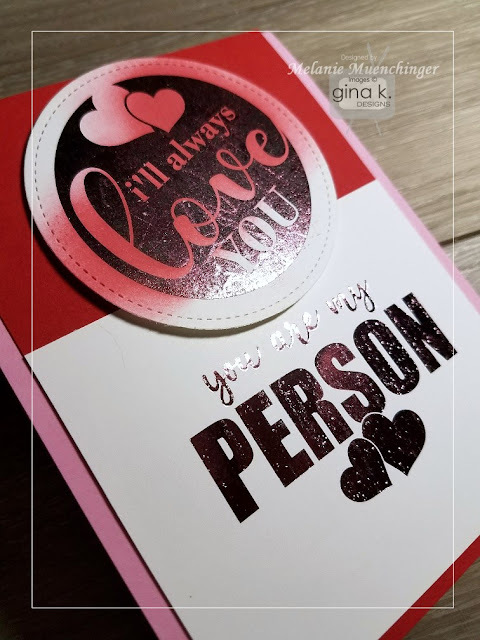 Share the Love with Foil-Mates Blog Hop! Good morning, all! 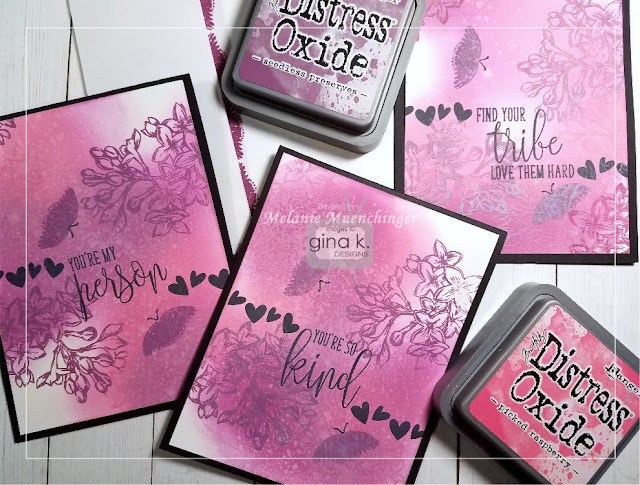 How about a quick hop to inspire with the new Fancy Foil and Foil-Mates products from Gina K. Designs? 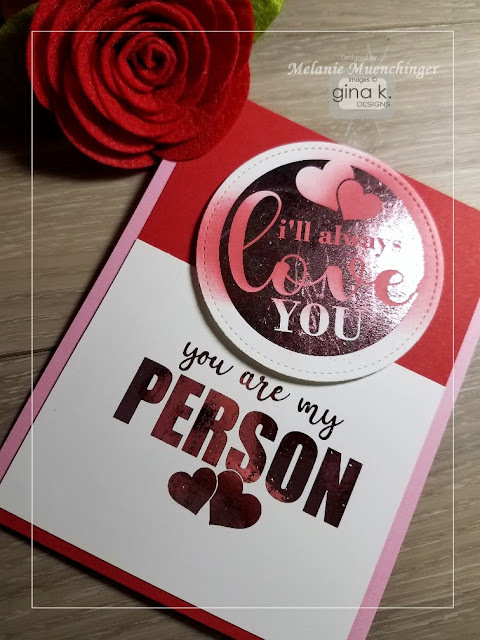 :) Please enjoy our ideas showcasing all the fabulous products and leave a comment on each blog as you hop for more chances to win a $50 gift certificate to Gina K. Designs. Winner will be drawn randomly and announced on StampTV. Check the Big New Forum a few days after the hop. Foil-Mates™ Backgrounds • Love and Kisses. 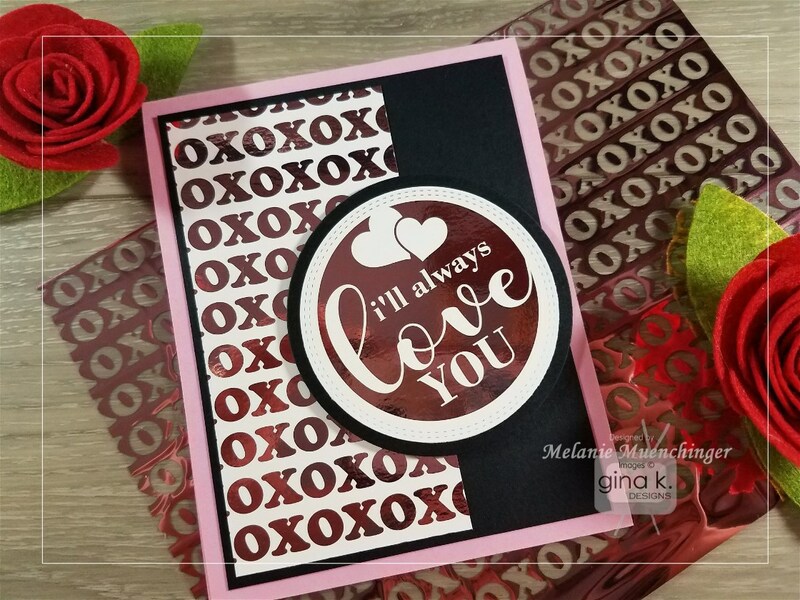 Round tag is from the Gina K. Designs Foil-Mates™ Sentiments • Sweet Expressions pack. I cut it out with one of the Double Stitched Circle dies, and matted both on Pure Luxury Black Onyx to really POP! Foil-Mates™ Backgrounds • Love and Kisses. Gina K. Designs Foil-Mates™ Sentiments • Sweet Expressions pack. I also want to point out how much I like how Gina has spaced these Foil-Mates designs. Not just with dies in mind, you can quickly crop the sentiments into rectangular mats with just a couple swipes of your paper cutter, and they are ready to make some quick foiled cards! Foil once, then cut twice, so easy! The background pieces you see here are from one piece of foil and one Foil Mate sheet. Ready to go on 3 cards! Foil is hard to photograph, but hopefully you can see the spots and texture in the foil in these two photos of this pink and red card. These are the "goofs"! The Red Velvet sponging adds another layer of texture and interest, and in my mind, makes the imperfect foiling make more sense, if you will. Cardstock iS GKD Pure Luxury Red Velvet and Bubblegum Pink. Ready to see more from the team? Let's go!